Patrick and his team have done a remarkable job of turning an ugly duckling into, if not quite a swan, a much more attractive bird with a rock-aimed boutique-y vibe. Today, we’re focusing on the Masquerader 1. We get a Tele-style ‘ash tray’ bridge plate, with three compensated brass saddles and through-body stringing, but the side walls of the tray stop just past the front of the saddles where the plate flares out to accommodate the full-size bridge humbucker. All the guitars in this range are voiced with USA-made Seymour Duncan pickups. The 1 pairs the full-size JB Trembucker (TB-4) at the bridge with a Vintage Soapbar SP90-1n at the neck. All three of these instruments are very well-sorted guitars, nicely weighted with slinky playability and a comfortable, workmanlike strapped-on feel. Barring a few pickup height adjustments, we’d happily head off to a gig with any of ’em. The 1’s neck-placed soapbar, however, holds its own and almost sounds too hot. 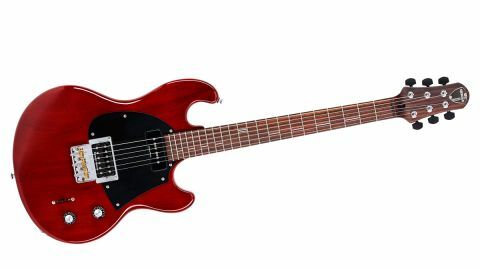 But the actual platform is really informing what we hear and recalls Gibson grind with less midrange ‘honk’, a little bolt-on percussion and less Les Paul-like tonal width. And while not lacking in high-end, it’s rounder than our Strat and PRS McCarty references. But nailing classic and more contemporary alt-rock sounds is easy and that neck soapbar proves a superb, softer-edged foil to the JB. Split the JB and there’s more jangle. Mixed with the neck, at reduced volume, there’s more than a hint of a Rickenbacker’s strident voice, which sounds great with modulation, be it old-school tremolo or modern chorus and flanging.